This is a semi-autobiographical book, describing the experiences of a group of boys at an American boarding school at the start of World War 2. The book begins with a first-person ‘Foreword’, describing how the author came to be enrolled in this particular school – the Dorset Academy, and ends with a first-person ‘Afterword’, describing what happened to the author and to some of his school-mates in the immediate years following the end of their school days. The main bulk of the story is told in the third person and follows the school-life of a number of the boys, and their masters, over the course of a few years. What I liked about the book: a strong sense of authenticity, the parade of different characters, the great dialogue, the depiction of the sometimes humdrum, sometimes brutal, boarding-school life. 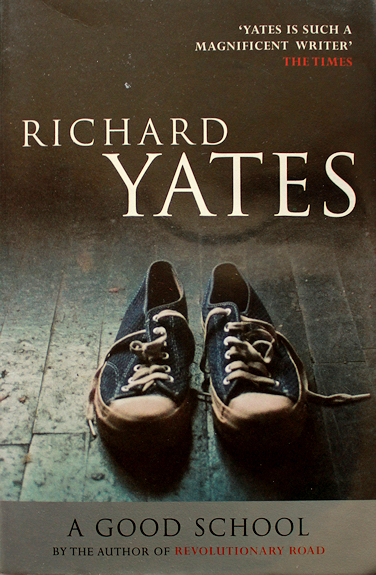 I liked the way Richard Yates creates vivid images by using a minimal number of carefully chosen words. Reading this book was a little like flicking through a photograph album or a collection of diaries. We are presented with a series of brilliantly sharp snapshots, as we dip in and out of various lives. What didn’t like about the book: the main difficulty I had with the book was in following such a large number of characters over the course of a relatively short book (169 pages in my small paperback edition). And the relevance of many of the characters to the main narrative appears obscure. For example, the book opens with a two-page, detailed description of a boy named Terry Flynn. He fades into the background later and doesn’t even feature in the Afterword. It took me a while to realise that the boy called Groves, introduced without any great fanfare a few pages into the book, was the main character – the author as a boy. One of the interesting features of this book is that there is no clear narrator. This gives us the opportunity to get into the heads of a number of different people – particularly the school masters. On the other hand, it was somewhat disorienting to the reader. I have to confess, I nearly gave up after the first chapter, when I had been briefly introduced to about 16 different characters, with no clear idea of who was the focus of the book. But it was well worth continuing with. The story-lines became clearer as I progressed.